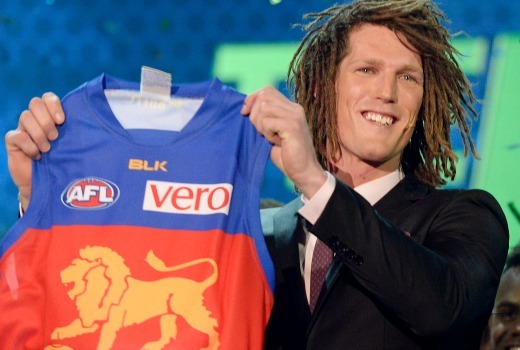 26 year old Matt Eagles has signed an AFL contract with Brisbane Lions after winning FOX8 reality series The Recruit. Last night the young player from Adelaide narrowly beat 21 year old West Australian Daniel Cox in a Live to Air finale hosted by Ryan “Fitzy” Fitzgerald. 23 year old Victorian Jordan Treloar finished third. Head Coach Mick Malthouse said: “Matt has got aggression and speed, and his marking ability is incredible – he has a great vertical leap. He attacks the ball like a hardened midfielder player, runs all day which gives him every chance to make it at AFL level. Before representatives from all 18 AFL teams, Brisbane Lions, Collingwood and Greater Western Sydney nominated Eagles in a special NAB draft. He chose to sign with Brisbane Lions, starting as a Category B rookie. The winner of the first series Johann Wagner spent a year with Port Adelaide before being delisted after one season. S2 was well produced and Mick Malthouse as coach was a winner..
Congrats Matt Eagles hope you can make a career at Brisbane. Great second season which I thoroughly enjoyed. Mick Malthouse was absolutely fantastic, so much better than Brad Fittler on The NRL Rookie. I honestly think Matt Eagles has a great chance of actually playing next year. Given I am a Lions fan I hope he goes well. Good to hear this feedback, as the numbers seemed to be lower than S1. For the sake of the show they really need Eagles to get re-signed at the end of next season, because Wagner was out of his depth at even state level.